Fox aired a special on the moonlanding hoax on Thursday night, February 15, 2001. It was re-aired on March 21. I was hoping the special might provide a balanced and skeptical treatment, but all hopes were dashed as I watched the special - it was focused on the "True believers" without any significant skeptical viewpoint. I watched the special like I'd watch a train wreck... out of morbid curiosity. Here are my comments on the FOX special. This web page is based on a typical "The Moon Shots Were Faked" web page authored by Kevin Overstreet (his version last updated 1-26-99). His original text when used is primarily in white except for any links and some red highlights. My comments will be found in this color. I am a Planetary Scientist at the University of Arizona's Lunar and Planetary Laboratory where I work on the Spacewatch Project to survey for small objects in the solar system, especially Near-Earth Objects and comets. I watched the Apollo Moonlandings on TV as a young boy, following every crew as they traveled to the moon and back and explored the lunar surface. It seemed like magic to an 8 or 9 year old, but as I grew, the Apollo program spurred my interest in science and I ate up everything I could about Apollo. My present interest in Apollo is historical. I love the details of how and why the Apollo spacecraft and the Saturn V launch vehicle worked as well as the details of the lunar exploration. I watched astronauts setting out experiments, picking up moonrocks, taking pictures and so forth, especially during the last few flights to the moon, but it wasn't until later that I really understood how and why they would pick a particular rock to sample or crater to visit. Understanding Apollo has lead to a great appreciation of it as well as a firm belief in the genuineness of the moonlandings. Everything fits together far too well to be a fake as some of the hoax proponents such as Mr. Overstreet in his website imply. Flying to the moon was not faked. It was not magic. It was engineering and applied science. And it was a spectacular achievment! My conspiracy theory for this report is that we never went to the moon. The whole dang thing was faked. When I had first heard of this idea, I though [sic] to my self that it was a load of rubbish. "Of course we went to the moon" Kept going through my mind. I had first heard of this Idea from a local Radio Talk Show, Ground Zero, which plays every Sunday night on KBER 101.1 They had brought up some interesting points, but I was not quite sure that I believed them, so I have taken this opportunity to study this Idea further. I am now convinced that we never landed on the moon, and it is my hope, that I can make you question it yourself. By all means, question the experts around you and also question those who question those experts. Look deep at the issue and decide for yourself. Facts are facts, though, and they will ultimately withstand the scrutiny, regardless of an experts opinion (or of what side of the issue he stands on). Extraordinary claims demand extraordinary evidence. The evidence that we went to the moon with Apollo is extraordinary, while the claims that we did not fall far short. One thing that I would like to call to attention, is that I am not an expert on anything that is written in this report. I don't know much about camera's, or non-atmospheric conditions, or physics or anything. I am glad that Mr. Overstreet admits this up front. As we examine the evidence he presents, it will be clear that he needs to become at least familiar with some of these topics if he does not want to be misled by the very arguments he uses. I am just a senior in high school, and about the only thing that I know professionally is how to run movie projectors. I challenge all that read this page to find something wrong with it, and tell me about it, so I can more accurately disprove one of the most historical events of the century..... The Landing on the Moon. "I challenge all that read this page to find something wrong with it, and tell me about it, so I can more accurately disprove (emphasis mine) one of the most historical events of the century...."
Mr. Overstreet has set out to disprove the Apollo lunar landings at all cost, regardless of the evidence we may present to him. He implies here that he is prepared to counter any evidence the would be de-bunker can provide. His goal is clear and transcends the facts. Disprove at all cost. It is with this cloud of close-mindedness hanging over the subject that I set forth to show to the doubtful reader that the evidence provided by the "the Moon landings were faked" crowd (from here on the TMLWF crowd) and Mr. Overstreet in particular do not stand up to scrutiny. Lets face it, there isn't really a heapload of evidence that we didn't go to the moon. Why would there be? NASA doesn't WANT evidence that we went to the moon. NASA wants people not to ask questions, and keep living their happy little lives. But here is some evidence that you cannot argue with. In fact, I can and will argue with this "evidence". My theory is that the moon landing were [sic] set on a sound stage, not in space. (Perhaps an Air Force base near San Bernardino, called Norton Air Force Base, where they have the world's largest sound stages under tremendously efficient security). If in fact we did go to the Moon, as NASA contends, then the evidence that we did go to the Moon should stand up to scrutiny. That evidence has been in the public domain for 30 years now in the form of photographs, images of spacecraft taken by astronauts in other spacecraft as well as images of the spacecraft heading towards the moon by telescope from the Earth, video records broadcast in real-time and seen in real-time, scientific experiments placed on the moon (whose placement was clearly documented by the lunar photography including still photography by the astronauts and video images transmitted in real-time), moonrocks and samples returned from the surface of the moon which support the supposition that they resided on the Moon (by examining the chemical makeup of the rocks, isotopic abundances, cosmic ray exposure ages, radioactive dating techniques, etc. ), and by the astronauts themselves both in situ on the lunar surface and after their return to Earth. The TMLWF crowd usually falls back on the typical large and complex, self sustaining conspiracy theory arguments, including the grand notion that they were faked by elaborate Hollywood style film fakery on some secret sound stage. Lets stop to ponder this for a moment. Think of the best special effects movies that you have ever seen. Now think of the inconsistencies and visual errors that even the casual and uninformed audience can see in these films. Now think back to 1969 and the movies that were made then. Could we have produced such fakery that it would not only stand up to the scrutiny of a 1969 audience, but also a whole generation of scientists familiar with the geologic study of celestial bodies? In fact, the only ones to find fault in this record is a small "cottage industry" group of TMLWFers. Most of the difference can be explained by the fact that the moon's surface is by no means flat and judging by the brightness of the left portion of this image, the top of the left astronaut's shadow (presumably Armstrong's) is on a small rise, so appears shorter. The area right behind Armstrong is dark and is a small downslope less well lit by the sun from its low position in the sky, and that is the general area where Aldrin's longer shadow ends. Also, compare the height of the two astronauts. The image of Aldrin on the right is about 10% taller than that of Armstrong on the left. If the astronauts are the same height in reality, then this demonstrates the effects of perspective on the apparent size and length of features in the image compared to their actual size or length. The shadow lengths are about 20% different which can easily be accounted for by perspective effects and by local terrain effects. This is a famous picture labeled "Man on the Moon" I have a poster of this picture hanging on my wall in my room, and it always gives me a chuckle. If you will look at area B you will notice a shadow cast across Buzz Aldrin's space suit. Once again, if the Sun is the only light source used on the moon, this shadow would have been MUCH darker. The Sun is the primary light source, however, it lights up not only the lunar surface, but the LM, the astronauts spacesuit, and anything else on the lunar surface so that light scattered off of those objects will fill the dark shadows with light. Try going into a small darkened room and shine a flashlight on the wall. The side of you opposite the flashlight which only sees the lighted wall will be lit by the scattered light off the wall from the flashlight spot. The Earth also adds some fill light to the shadows, but the Sun dominates the lighting on the Moon. Another thing to consider is that the astronauts spacesuit is almost pure white, like a sheet of paper, while the lunar surface is charcoal black. The photographic exposures make the sunlit lunar surface look much lighter in color than it is and also allows the images to show detail in the shadows, particularly of bright white space suits that are not very strongly lit by the scattered light off of the lunar surface, the LM, and anything else on the moon. Looking at area C you will notice that the surface of the moon fades off into the distance, then is met with the moon's horizon. In a no-atmosphere environment, the ground shouldn't have faded out, but stayed crystal sharp unto the moon's horizon. This is a simple case of lighting effects. The scattering angle off the near surface is viewed from a steeper angle than that of the lunar surface off in the distance. The local terrain contributes greatly to the brightness of the near surface too. The apparent out of focus of the horizon area is caused by the image being focused on the astronaut in the foreground - simple optics. Also, the Lunar Module reflects significant amounts of light into the area behind Aldrin as can be seen in this image of the general area. Looking at area D you can plainly see some type of structure reflected through Aldrins helmet. I do not know what it is, but it is there. There are two items that are seen reflected on the left side of Aldrin's visor. One is the Solar Wind Collection (SWC) experiment and the second is the Flag. The exact location of the two astronauts in this image is around on the left side of the LM as viewed from in front of the LM (where the ladder is located) so that the smaller, leftmost object is the SWC and the "mystery object" is the Flag. AS11-40-5886 from the Apollo Lunar Surface Journal (refered to later as ALSJ) shows both the Flag and the SWC. 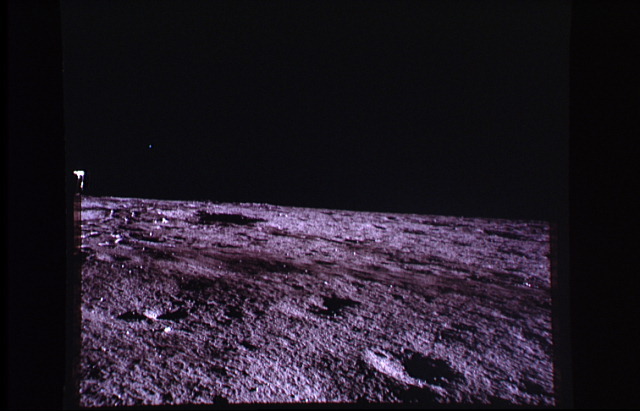 The famous picture was taken by Armstrong from the area right of the SWC while Aldrin was standing just on the other side of the footpad visible on the right in this image. The two items appear small and far away despite their relative nearness due to the convex, spherical shaped visor, making objects appear farther away than they actually are - not much different from your rearview mirror which does something similar, allowing you a more complete view of the area it shows while shrinking objects seen in the mirror. See the closeup of this image at the top of this webpage for a better view of what is seen in Aldrin's visor. In this picture, taken from the LEM, you can see at least two abnormalities. In section E you see an abnormal shadow on the moon's surface. 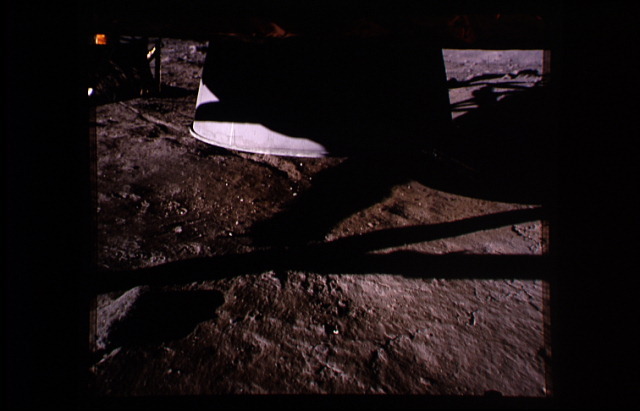 NASA claims that this shadow is the shadow cast by the Lunar Module, but on earth, even when aircraft is flying low to the ground, it does not produce such a clearly defined shadow. The item labeled E is not a shadow on the lunar surface, but is a silhouette of the nozzle of one of the RCS (reaction control system) engines on the LM. You can find similar silhouette's of the same nozzles in images taken from the LM cabin out the LM's triangular windows of the lunar surface. For example see image AS12-48-7025 (from the ALSJ) taken from the window by Apollo 12 astronaut Pete Conrad after landing on the Moon but before that mission's first EVA. OK, here's the kicker... if you will look at section 3 you will notice there are no stars in the sky. In fact, you will never see any stars in any NASA Moon photographs, or hear an astronaut mention anything about the glorious stars that are visible when out of the earths atmosphere. This is perhaps the favorite argument of the TMLWF crowd. "There are no stars to be seen in any of the NASA Moon photographs." It is also one of the most easily countered arguments. The lunar photographs show no stars in them because they were exposed for the daylight lit lunar scenes! This badly underexposes any stars in the sky. Try setting up a manual camera (the autoexposure cameras won't easily allow you to do this) for a typical daylight exposure - use the "sunny 16" rule where you set the f-stop of your camera to f/16 and then set the exposure length to the recipricol of the ASA film speed - if you use ASA 100 film, use 1/100 of a second (or 1/125 which is more typically available). Then take a picture of the sky at night. To be sure you're simulating the lunar situation, be sure to light up a foreground object with full daytime lighting so that the printing process will be sure to expose that part of the image properly and not super stretch the dark sky. You won't find a star image there either. Similarly, the astronauts eyes are adapted to the daylight scenes around them so they didn't see stars in the sky either. As an experiment to verify this affect, go from a brightly lit room to a dark location just outside and see if you see any stars when you first look up at the sky. Stars were seen, however, when the conditions were right and the crew was dark adapted. One other point - the dark area near the area labeled 3 above the lit part of the lunar surface in this image is in fact the dark side of the moon, not the sky. if you look in areas 6 and J, you will again see no stars. As you should not - see the previous section. In area K you will notice that one side of the LEM in covered in shadow, but somehow the symbol of the US flag in [sic] illuminated. This very well could have been a touch up job. But it isn't a touch up job. 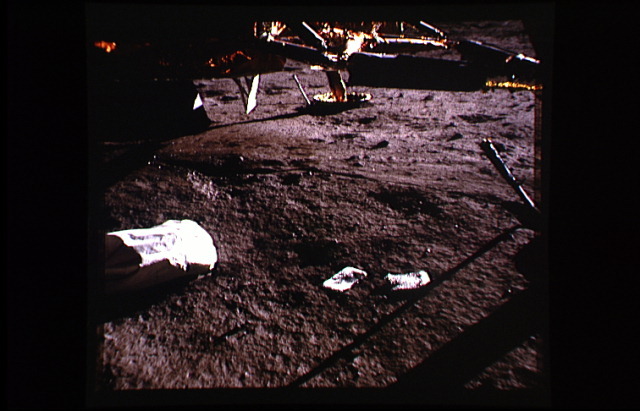 See the section describing shadows on Aldrin's spacesuit. The area is lit by scattered light off of the lunar surface. Which is the same reason for why Irwin's shadowed spacesuit is visible as well, or the shadowed parts of the rover, etc. This is a picture of Alan Bean holding up a Special Environmental Examiner Container [sic]. This picture was taken off a camera that was strapped to Conrad's chest. If the camera was attached to Conrad's chest, the top of Bean's helmet L should not be in this picture. The device Bean is holding is called the "Special Environmental Sample Container" (or SESC). There are several reasons why we see the top of Bean's helmet here. First, the lunar surface is not flat and from the location of the middle of the frame here, it is apparent that the relatively short Pete Conrad is probaby standing on higher ground than his taller crewmate Alan Bean. Second, the helmet is roughly spherical in shape, so we can see around towards the top of it and finally, because of the backpacks, the astronauts tended to lean forward somewhat to balance in the lunar gravity. The same aguments made for this image could be made for the picture of Buzz Aldrin shown earlier. 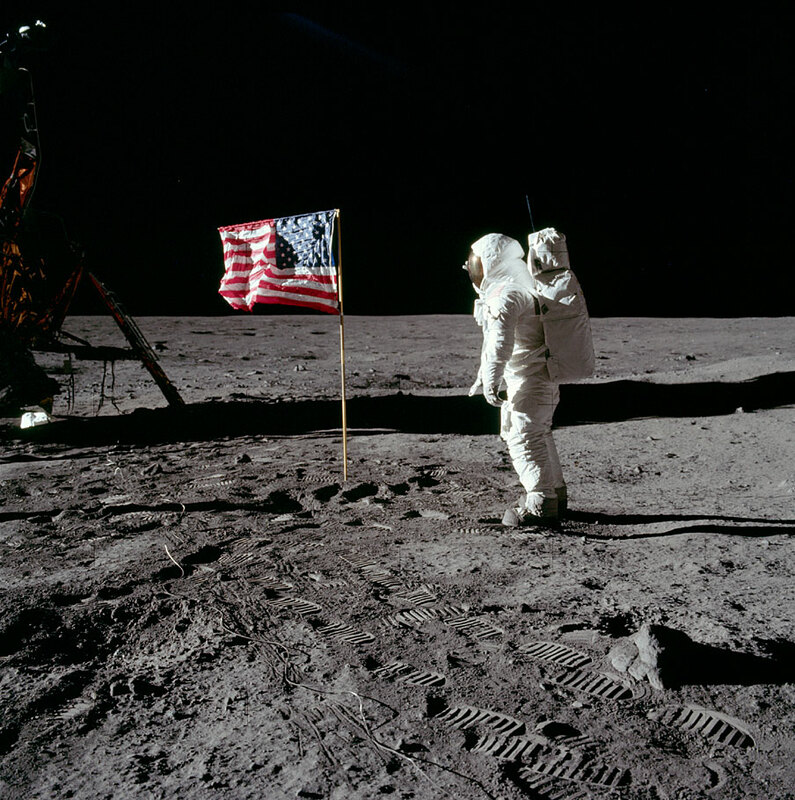 You can see this in another famous Apollo 11 image of Buzz Aldrin saluting the Flag: AS11-40-5874 seen here in an image from the collection at the ALSJ. All of the shadows reflected in Bean's visor M are going off in separate directions, not in parallel lines like they should be. And why should they be going off in parallel lines? The astronaut's visor is spherical in shape which badly distorts the images seen reflected in it. Check the image of Buzz Aldrin presented earlier in this collection (and reproduced below) and you will see at least 4 discrete shadows visible there, and they behave in a similar fashion to those reflected in Bean's visor. Also note the distortion of the LM's leg. If you will look at the Environmental sampler that Al Bean is holding, N, The reflection is coming from a light source other than the sun, but it is possible that light is being reflected off the space suit. It is being lit by sunlight scattered off of Bean's spacesuit. There is a strange anomaly in the sky 7, It is [sic] yet to be determined what that might be. It may not be determined by the TMLWFers, but it is pretty clear that it is scattered light from the bright sun which is off to the left in this image. See, for example, the glint of sunlight on the top left part of Bean's visor. Bright sunlight impinges on many lunar photographs, many much worse than in this image. Any experienced photographer will be very familiar with lens flare and scattered light when taking photographs towards a bright light such as the sun. In our last picture, I would like to direct your attention to the circled portion of the screen. These Lunar Rover tracks are quite well defined, don't you agree? Well, the fact is, you need a mixture of a compound, and water, to make such defined lines. I don't know if that idea is so convincing, but I assure you, this next one is. The lunar dust is very fine and adhers to boots and anything else despite its lack of water. It clumps together in the form of any pattern imprinted on it. No need for water to make it do this. Try imprinting a coarse object into a pile of dry flour or dry dirt. You will find that it tends to work similarly despite its being dry. Similarly, you can easily see shoe prints, tire tracks, animal tracks, etc., in dry dirt here on Earth - without any water to help. Taking this TMLWF argument to the extreme, if waterless material would not preserve things like footprints, wouldn't the lunar surface slump to a perfectly spherical surface - all those mountains and craters would disappear. If you look at the rock labeled R you will notice a the letter C carved in the rock. Perhaps a gag left by the props department? The original image (AS16-107-17446) as well as all of the color images from Apollo 16, have a purplish cast to them, indicating some problem with the entire batch of film, either in the source, the developing or in the environment they were exposed to during flight. At first, I thought it was just fading of the prints themselves after 20+ years in a notebook on a shelf, but I also examined the transparencies, and they also have the purplish cast to them. The prints and transparencies I am looking at are probably 3rd or 4th generation from the original image (the first generation was copied once after processing and have since been stored away, untouched with the 2nd or 3rd generation being used for subsequent reproduction). The "C" likely was introduced when the image was copied to be processed to color correct it and the color corrected image which included this artifact has been propagated to a number of different publications. The artifact was likely due to some dust or lint introduced during the scanning or color correction processing. Here is a portion of the previous picture, blown up. Take a look at the cross hairs that appear on the picture. These hairs appear on EVERY lunar picture. These cross hairs are placed between the shutter of the camera, and the film, supposedly. If you take a look at the cross hair on the left, this cross hair was placed behind the lunar rover, you can see the Lunar Rover is in front of the cross hairs. Film is not a perfect recorder and in the case where an object is so bright white, it will saturate and bleed over into adjacent parts of the emulsion. If you look at the very edge of the cross-hair where it hits the antenna on the rover you will see that it is slightly darker and does slightly cut into the image of the antenna despite its saturation. You need to look at the original image, however. I tried to find a credible man to get my facts from on this subject, and I found just that. The following information came form Mr. Bill Kaysing, seven years head of technical publications for the Rocketdyne Research Department at the Propulsion Field Laboratory in the Simi Hills, near Kenoga Park (actually, Canoga Park - ed. ), California. During this time as head of technical publications for Rocketdyne, Mr. Kaysing had a Top Secret clearance. Impressive credentials do not equate to accurate knowledge. Perhaps you should look at the original evidence yourself rather than relying on others interpretations, and you should look at much higher quality reproductions of the original images rather than the ones poorly reproduced by Mr. Overstreet and shown here. See the ALSJ for example to see a collection of such images as well as a catalogue of all the lunar surface imagery. An average days temperature on the moon ranges from 260 degrees F to 280 degrees F, too (hot) for film to survive. At those temperatures, film crinkles up into a ball. The mid-day temperature on the moon is indeed around 260 degrees Fahrenheit, however, the low temperature in the dark of night is about minus 250 degrees Fahrenheit! The lunar landings and following exploration was done when the sun was low, within a day or so of local sunrise at the landing site at the time of the landing, so that temperatures were actually quite moderate, even after a full 3 days on the lunar surface. The film in the cameras was also kept in magazines that provided some protection from the extreme temperatures even when left in direct sunlight. In a vacuum without an atmosphere to conduct heat, film inside the magazines it was carried in is quite well protected from the heat of direct sunlight. About 20 miles about [sic] the Earth, there is a radiation belt named the Van Allen belt. No human can get through this belt, If you try than you get hit with 300+ rads of radiation. Unless they are surrounded on each side by 4 feet on lead. In fact, the Van Allen radiation belts extend from about 600 miles up to more than 40,000 miles from Earth with the region of highest radiation intensity being between around 2,000 miles and 12,000 miles above Earth. The astronauts exposure to those radiation belts is brief (less than 4 hours total - they begin their time in this region while traveling at 25,000 MPH! And they pass through it twice, once outbound, and again on their return. They spend less than an hour in the densest part of the belt.) and they are well protected in their spacecraft. Here is a link to a webpage that describes the radiation environment and physiological effects on the Apollo astronauts. Also, the belt is toroidal in shape (like a donut) and the trajectories of the Apollo spacecraft were designed to avoid the worst part of the Van Allen belts. Even the discoverer of the Van Allen belts, Professor James A. Van Allen, has noted that the belts would not have been dangerous to the Apollo astronauts given their trajectories and their spacecraft. There are millions of micro-metors [sic] traveling at speeds up to 6000 MPH, which would tear the ship to pieces. In fact there are many more than "millions" of bits of would be meteors out in space, and they travel at speeds as high as at least 120,000 MPH! Despite the large numbers and high speeds, the space density of these objects is quite low so the average interval between impacts on an astronaut is extremely low. The spacesuits the astronauts wore on the lunar surface had layers designed to stop such small particles (we're talking micron sized bits!) to protect the astronaut. If you look at the pictures/video of people on the moon, you will never see more than 3 stars. 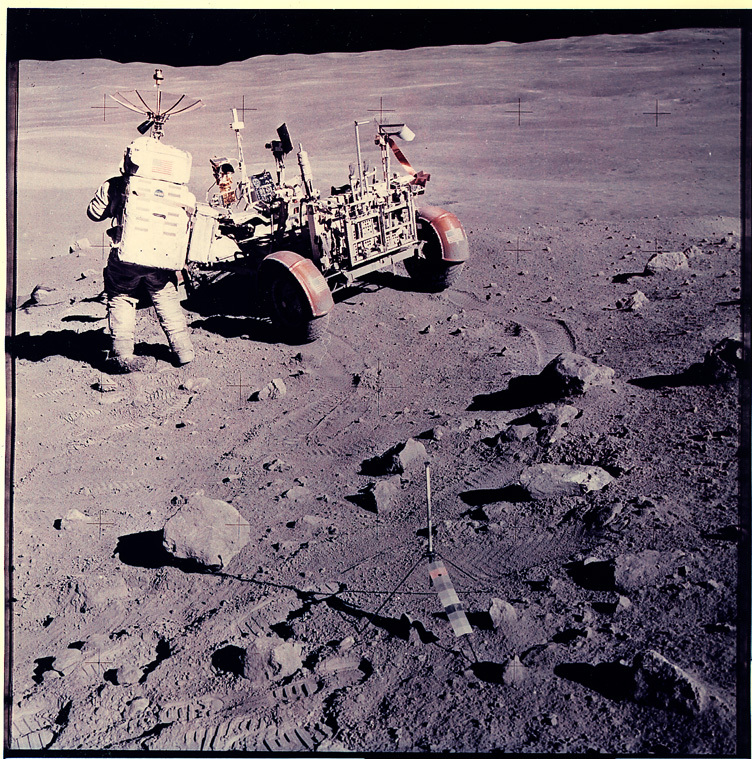 When the LEM set down on the Lunar surface, it gave out 3000 lb. worth of thrust. This would have created a massive hole underneath the Lunar Module, but in pictures of the Lunar Module, the ground underneath is untouched. On the contrary, there are many photographs which show the disturbance of the lunar soil under or near the Lunar Module. For example, see AS11-40-5892 or AS11-40-5921 (from the ALSJ) which shows not only some discoloration under the descent engine, but also some radial disturbance in the soil from the outward blast. 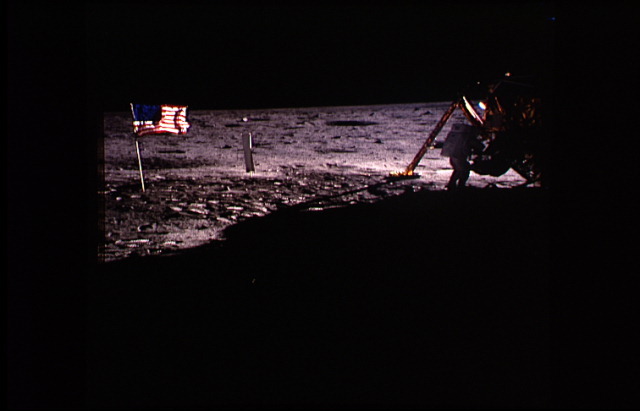 Also, see AS12-46-6781 which shows a trail of disturbed soil along the ground track of the Apollo 12 lunar module. On the left edge of this frame is the TV camera with some footprints right next to the small crater. The engine exhaust trail goes almost straight across the lower part of the image, about a quarter of the way from the bottom of the frame. There is some disturbed soil caused by an astronaut's footprints that angles diagonally across the exhaust trail, meeting it at the right edge of the image. If the landings were faked, placing a blast crater under the LM would be the most obvious thing to do in order to "fool" the unwitting public. In fact, there was plenty of dust, but the moons' regolith is rather densely packed due to billions of years of gardening and a lack of air on the moon. Also, the expectation of having a blast crater (presumably looking like a fresh impact crater?) under the LM is flawed. Does a garden hose sprayed at high pressure into the dirt create a blast crater? It surely blows the surface dirt in a radial direction and will clear out a small hole, but not a blast crater (like an explosion of dynamite, perhaps?). There is even an Earthly example of a rocket landing on dirt. The DC-X was a test flight program of a vertical takeoff and landing rocket. On one of its last flights, it made an emergency landing outside of the pad area. Despite the hydrogen/oxygen engine producing a thrust of some 60,000 pounds (about 20 times the thrust of the LM descent engine! ), the engine produced a mark on the desert floor that was barely recognizable. Given that the descent stage engine bell is about 5 feet across at the bottom, and that thrust of the engine at touchdown was about 3,000 pounds, that blast pressure of the rocket exhaust was only about 1 pound per square inch - not much different from the pressure caused by the weight of an astronaut on the Moon standing on one foot while walking across the surface. MONEY. NASA gathered about 30 billion dollars pretending to go to the moon. That means that someone is getting a lot of money in their pockets. That would be all of the aerospace companies and their workers who built the rockets, spacecraft, rovers, spacesuits, launchpads, etc. as well as those who supplied them with the raw materials they needed. We spent that money on our own people - not one cent was spent in space or on the Moon. It's been said that for every penny invested, we got something like 7 cents back in spinoffs, including jumpstarts on integrated circuit technology (and ultimately therefore, the computer you are using to read this webpage), component miniaturization, materials science and a long list of other items. These things would have been developed anyway, most likely, but their use in the Apollo program sped their developement up a great deal. ATTENTION. If you ever saw the movie "Wag the Dog", the president has sexual relations with a 12 year old. This information goes out to the media 1 week before elections. So, to get the publics mind off of the little Girl, the president stages a war with Albania. The moon shots were the same concept. People did not like what was going on with the Vietnam war, so, to get the publics mind off of all the bad things going on in Vietnam, the US faked a moon landing. If you check your dates, we abruptly stopped going to the moon around the same time the Vietnam War Ended. Check the dates and facts a little more closely. Plans to end the Apollo moon landings were already in the works by the time we made our first landing in 1969 - years before the end of the war in Vietnam was even in sight. Our first lunar exploration ended far from abruptly. It was planned well in advance. There were originally moonlandings planned through Apollo 20, but first Apollo's 19 and 20 were cut, then Apollo 18, making Apollo 17 our last lunar landing of the 20th Century. The Apollo program was initiated before the U.S. was substantially involved in Vietnam, and more than 4 years before it could be considered a war. Apollo grew out of a cold war conflict over the minds and opinions of our technological prowess in the world and its eventual success was due to the hard work and sacrifice of literally 100's of thousands of people who built the Saturn V rocket and the Apollo spacecraft. Tell them that their work was some elaborate hoax. TO WIN THE SPACE RACE -- Back in the late 60's early 70's, Russia and the US were in a heated battle to see, well, pretty much who was better. Once the US realized that they couldn't send a man to the moon, they couldn't just say, "OK Russia, we give up." Whether or not you believe we went to the moon or not, I hope that some interesting questions have been brought to your mind through this report. Sorry, but I found no interesting questions brought up by Mr. Overstreet's report. I only found errant or exaggerated "evidence" which do not substantiate the claim that the moon landings were faked. I find that there are far too many consistencies in all of the available evidence to have any doubts whatsoever that we landed on the Moon during the Apollo program. The arguments presented in Mr. Overstreet's website are almost identical (and in fact, the pictures, including annotations are identical) to several other TMLWF sites. My debunking is not aimed only at Mr. Overstreet's website as the very same arguments are widespread amongst the TMLWF crowd. Here are some links to related websites critical of TMLWF arguments. Here is another critique by me (JVS) of an article on Faked Moon landings by a reporter named James M. Collier. Here is a critique of the James M. Collier video Was it Only a Paper Moon? by Larry Jacks. Here is another critique by me (JVS) of an article on Faked Moon landings from the "American Patriot Friends Network. My comments on the FOX program "Conspiracy Theory: Did we land on the Moon?" Jim McDade's Moonlanding Hoax debunking page. Moon Hoax or Moon Landing?. Here is a link to an excellent experimental site demonstrating lighting conditions seen in the lunar photos. The "Luna Ticks" TMLWF website. A rebuttal of a report on the "Moon Landing Hoax" in the "Weekly World News". Here is a Spanish language hoax debunking page inspired originally by my page written by Alberto Matallanos. Here is my first attempt at an FAQ on the Moonlanding Hoax. Created by Jim Scotti, 1999 July 28. Last updated by Jim Scotti, 2011 March 9. Installed the entry and exit votes. Also began these change logs. Minor tweak to the light source section. Added a paragraph in my conclusions. Changed the link text below and added a link to my home page. Changed text colors to improve the webpage readability for those who suffer certain types of color blindness. Made a few gramatical tweaks. Added a link, changed another and initial comments on the FOX Hoax show. Added a link to my FAQ on the subject, and to my comments on the FOX special. Added a link to an excellent experimental site demonstrating lighting conditions seen in some lunar photos. Added a note on FOX re-airing of their moonlanding conspiracy special. Also added a link to Phil Plait's FOX special page. Added several new links to some debunking sites. Minor editing of section describing lighting affects in the image of Buzz Aldrin with helmet reflections (nasa3.gif). Added an introduction to myself. Added a link to Jim McDade's website. Added a link to a page on radiation effects. Added a link to the Moonbase Clavius website. Added a link to the NASA Human Spaceflight hoax debunking website. Added a link to a new page by me debunking a webpage on the American Patriot Friends Network. Updated the link to Ian Goddard's experimental site. Added a link to Larry Jacks website critiquing Was it Only a Paper Moon? Added a link to an Article in the Floridian and one from the UPI. Clarified a sentence regarding observation of spacecraft heading towards the moon. Added a link to Alberto Matallanos' Spanish language hoax debunking page. Added note on Canoga Park (Overstreet id'd as Kenoga Park) - Thanks to Jim Garrett. Updated a description of the spacesuit design to protect against micrometeorites. Updated links to Jim McDade's webpage. A few minor tweaks & I fixed the exit poll. Added indentation in Overstreets original text to make it more distinctive from my analysis. Corrected a link to an image from the ALSJ which had changed. Added a link to "Moon Hoax or Moon Landing?". Edited some insupported characters from the title and elsewhere. Click here to go (or return) to my Apollo page.